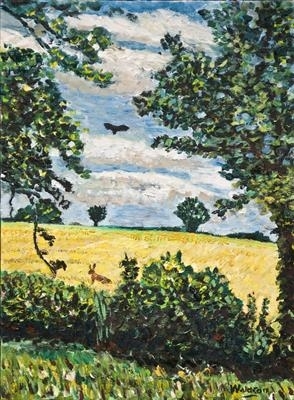 Small oil of a cornfield in Oxfordshire at Witney. The hare appeared whilst I was painting and the Buzzard was circling so I felt that a story was unfolding. I had originally placed a combine harvester in the field but decided that it looked a bit like a shed, so changed it. 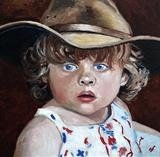 Limited edition giclée prints at £100 on canvas ready to be mounted on board. The original £275 framed. Please be assured that any prints are virtually indistinguishable from the original except for the lack of impasto. The scans and printing are of the highest quality and should last a lifetime. I arrived at friends who live in Witney and needed space to paint. I set up an easel in their grounds and looked at a field of ripened corn about to be harvested. This work was completed in about half a day but I added the hare and buzzard after that, having painted over the combine harvester. This is en plein aire painting as the impressionists intended. I used the new Winsor and Newton water based oils and the whole was dried in about three days.